All founders dream of building everlasting public companies that will live on long after they are gone. However, after a few years of struggling and working for free the idea of being acquired for a nice payday can seem very attractive. In fact, if you read TechCrunch too much, you might believe that an easy way to get rich is to start a company and sell it for $100M in two years. While getting acquired is a great exit for any company, planning for it is a very bad idea. Even worse, starting a company with the goal of being acquired will set you up for failure before you even begin. To understand why, let’s think about how potential acquiring companies look at acquisition targets. Large companies acquire smaller companies to gain assets they don’t have access to any cheaper way. Acquisitions, even small ones, are expensive ways to gain assets so acquirers are highly motivated by what is necessary to improve their own business. People. All of the employees, including the founders, and the expertise they have developed working at your company. If everyone works together extremely well, that teamwork chemistry can also be considered an asset by acquirers looking for productive teams. Product. 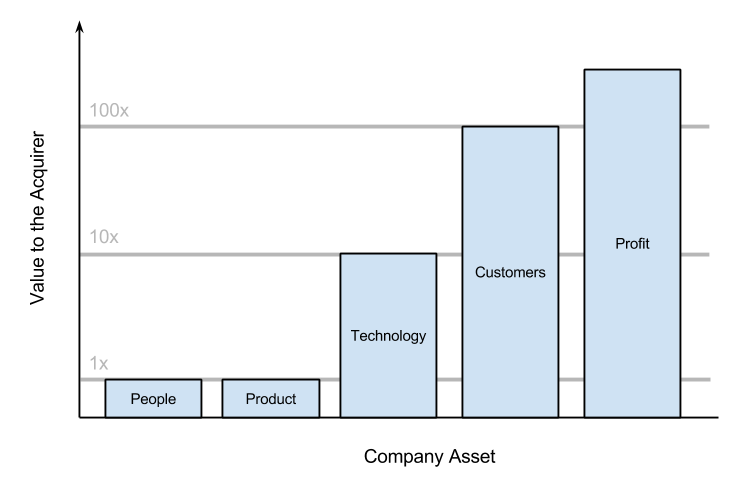 The product(s) you have built, whether or not they have been released to customers yet or not. Technology. Any unique algorithms, mathematical models or processes you have developed even if they aren’t patented. Customers. Everyone using your products, whether or not they are paying you for them or not. In some cases, you may only have one customer but that customer is a very large customer who pays you a lot of money over a long term. Profit. If your business is profitable, that positive cash flow is a huge asset since it produces a return for whoever owns the business. The same can be true of having a lot of liquid assets as the result of being profitable. Not all of the assets are created equal. Below is an illustrative example of the comparative values of assets based on the acquisitions I have been involved with (both as the acquirer and the acquired companies). Example of how corporate assets compare in terms of value to acquirer. Technology is 10 times more valuable than people or products, while customers are 100 times more valuable. Profit can be infinitely more valuable, depending on how much of it you have. Note that these are just illustrative. Why are assets valued so differently? For the simple reason that the value of your assets are entirely dependent on how they apply to the acquirer’s business. For example, the value an acquirer assigns to your technology is not the value they would get from selling it themselves on the open market, but how much value it will add to their business. It is not enough that your technology is new and ground breaking, it needs to help the acquiring company make money. It’s not a coincidence that the assets that have the highest value are developed later in the life of a company (customers, profit, etc.). Those assets are the hardest to build and therefor will carry the most value. That is one of the many reasons that companies become more valuable the longer they exist and why it’s so rare to see a big acquisition of a young company. It is almost impossible to make generalizations about acquisitions because each acquisition depends so much on the companies involved. One acquirer may value your company at $5M while another values it at $20M, because the second company believes they can use your assets to increase their own profits by $40M. So, remember that the previous example is only illustrative. But that is exactly the reason you should never focus on being acquired! You have no way to control how potential acquirers will value the assets you are creating. Successful acquisitions require the right acquirer to value your company at the right price, at a point where you would consider selling. That combination of factors is rare and definitely not something you can plan. So what does that mean? The best strategy, in fact your only strategy, is to focus on building a successful and highly profitable business. As long as you do that, you will control your own destiny and decide if and when you get acquired on terms you decide. Or, maybe you’ll go public! Then you can buy some companies yourself. This entry was posted in Business, Strategy on November 5, 2014 by Sean. I agree with the message of your post – you should focus on building a business and doing the things you can control. Since you can’t predict the right market conditions that would make you valuable in the eyes of a larger fish, that’s really the only option. I missed, however, why that means you **don’t** want that to happen at some point. Perhaps the word “don’t” is unclear, but if your focus is building a profitable company then you should believe there is more value in building your business to its full potential. Hence, you don’t want to be acquired because the acquisition won’t give you the full value of that potential. Unless you get an offer that does, in which case you should be happily surprised! True, very true. You mentioned being on both sides of the table (for aquisitions) – As a seller did it happen as a happy surprise for you? I’ve been involved with companies that want to sell but can’t find a buyer, and I’ve been part of companies that get a series of acquisition offers that they turn down because the price is not high enough. Whenever I have been part of a company where the acquisition offer matches our belief in the future potential of the business it has definitely been a happy surprise!